I’m so excited about the following guest post from Mike and Molly’s House. She is like a younger, slightly less eccentric version of Babci with her own chickens and all. I’m sure someday her daughters will be blogging about all the crazy things she used to do with raw eggs. Molly even makes her own beauty products. Just over a year ago, she went on her debt free journey and the result is that she and her family knocked out over $50K in debt in 1 year. I really enjoy her site and her fun loving readers. If you don’t follow her yet, I suggest heading over. Several people have asked Molly to write about her latest adventure of building her guest house out of junk mail . I’m honored that she chose to allow me to publish her article right here on First Gen American. Enjoy! I live on a odd little homestead, kind of. It’s getting there, at any rate. My husband, kids and I raise chickens, bees, and this Spring will be adding ducks, pigs or maybe goats (god, I hope the goats don’t win out!). Around here things are always changing. My husband, Michael and I currently work in the construction industry with expensive art degrees behind us. We love to make things. All kinds of things….. Our guest house was a yurt, also known as a ger in Mongolia where it’s from. Our main house is a double-wide mobile home (1986 vintage). It’s 1100 sq ft which is the perfect size for us but add a guest or two and it gets a bit cramped. Having a guest house even as rustic as the yurt has been a god send! I covered the interior walls with silk and the furniture was bought with our ‘wedding money’ (rather than gifts we asked for cash to furnish the yurt). The furniture is from far away places. In the center is a wood stove to keep it warm in our cold winters. Up in the ceiling is a beautiful skylight to see the stars at night. When you enter the yurt through the hand painted orange door it’s quite enchanting. What’s a yurt, you ask? It’s a round tent like structure- ours is about 300 sq ft. They are still used in parts of Mongolia and Central Asia where nomads move around carting their home with them. Our yurt was bought originally by an American woman who had been traveling in Mongolia working with a non-profit agency that built straw bale homes for the locals. She wanted to bring back a yurt for herself and decided to get enough of them to fill a cargo container, ship them back to the US and sell all but one to pay for the trouble and shipping. At the time there were several people selling yurts in our area and hers was by far the most beautiful and inexpensive. You say you ‘had’ a yurt? After standing for 5 years the mice got into it, along with the rain and it wasn’t the romantic hide-out it once was. We took it down and packed it up. Our dream was to rebuild it making it mouse proof and more durable. My husband is a combination of inventor, do-it-yourselfer and just plain crazy kind of guy. We are ‘project people’ and build lots of ‘things’ on our 2.5 acres. He was investigating paper-crete and we decided this would be a great material to rebuild the yurt with. What the hey is ‘papercrete’? It’s a building material that contains concrete and can be formed to make blocks. Think industrial paper maiche. To make paper-crete you mix up paper (we use junk mail), water and a bit of concrete. It’s incredibly light weight (which I love!) and has great insulation value (although it’s debatable what the R-value really is). Here comes the junk mail! You need 65lbs of paper to make about 45 blocks. Each block is roughly 5″ x 8″ x 14″. It takes a lot of paper! He uses junk mail for his paper source. Michael must have come up with the idea in the winter because by the time he made his first batch we had saved several hundred pounds of junk mail. We have the worst recycling program in our county. It’s almost non-existent so it was great to re-use all of this useless (useless to use, that is) paper! We just added a trash station where we shred all of our trash. It will go into future paper-crete projects. 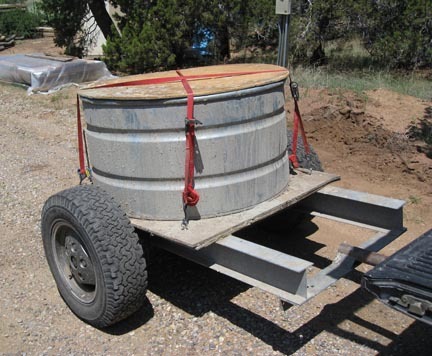 If you want to learn how to make your own PaperCrete Mixer, Click Here. 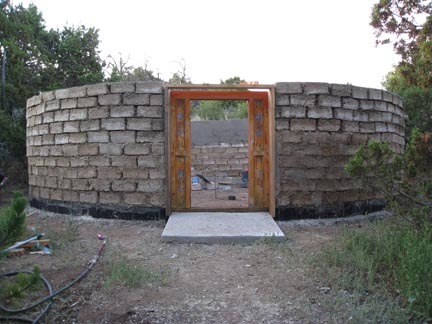 How much does a papercrete yurt cost? Have we finished building our papercrete hideaway? No. The walls are up. The yurt lattice walls will be placed inside the paper-crete walls, the roof posts will get reinstalled and a new roof constructed on top. Because we are trying to spend the very least amount of money we are waiting to acquire a cheap/free option for the roof. I’d love to have a metal roof but it’s a hard material to find for cheap or free. We need to seal all the cracks between the papercrete blocks and the outside of the blocks will be covered in an adobe dirt plaster (prehistoric stucco). We live in the high desert of NM where dirt is plentiful. My aesthetic is closer to a clean finished craftsman look as opposed to what I like to refer to as the junky ‘hippy look’ (no judgements- it’s just what I like). We are using ‘hippy like’ techniques like dumpster diving, reusing materials and trying to get a beautifully crafted yurt…it takes time to combine the two! Michael spends his free time on Craigslist and Freecycle finding great deals on construction materials. Occasionally I join him on his hunts for materials. It’s a lot of work but there is something kind of fun about being out in the middle of an abandoned building sifting through old lumber with him and imagining what we could do with a particular material. I realize we are not your typical couple but we wouldn’t do it any other way. Michael was laid off this March. Until he finds other employment he’ll have lots of time to search out free materials to finish our little piece of junkmail heaven. Sandy’s Closing thoughts: I’d totally stay here if I were invited! I’m sure it would be cozy and warm and decorated all adorable-like complete with fuzzy pillows. (I hear one of Molly’s weaknesses is cute pillows.) Hey Molly, one other question. What will the flooring be made of? I love the Yurt!!!! It is a great project to use recycled paper and the outcome is long lasting and charming. I can’t wait to see it when it is finished! I want one…..
It’s an amazing project, worthy of a story in the local media once it’s finished. Well done, Molly and Michael. For whatever it’s worth, I recommend ducks. Last summer I traded a jar of basil pesto for some duck eggs, and they are just incredible! We were all set on the ducks. They seemed the easiest of the choices. Michael just informed me yesterday he is overwhelmed with all the garden projects and that he wants to hold off on the ducks. Fine by me! One less thing to do around our house is always appreciated. There’s always next year. I’ve been waiting for this post! Awesome! Wow! I had no idea junk mail could be so useful! Talk about recycling – this is a whole new level! It’s an amazing, unique and ‘green’ project! Thanks for sharing – I learn’t what a ‘yurt’ is today! That is such a great idea. It sounded like a neat little hideaway, I bet you can’t wait for this one to be finished. @ Sandy: Thanks for the sweet introduction and letting me guest post. The more I read about Babci the more I see myself. I think my girls may differ with you and tell you I’m the more eccentric one! The flooring in the yurt will be maple. Our friends have a pile of maple flooring they salvaged years ago from somewhere else. We are doing some sort of trade with them for the material. I can’t wait to have it back up and have guests coming through (yes, you have an open invite). We often had friends of friends of friends staying in the yurt. They would find out about it and beg to stay. We’ve meet a new and interesting people having the yurt! Molly – More eccentric? I doubt it. I’d like to see the contents of your suitcase the next time you take a trip somewhere. Well, I guess it probably would have bags of white powdery stuff in it (baking soda). See, Babci’s got competition! I’ve carried a sewing machine on an airplane more than once. I love this idea! I’ve seen images of yurt’s and they do look romantic. I like that you’ve found a use for all that junk mail. I can’t wait to see images once it’s finished. This is just too cool – it makes the same part of my brain that likes secret passages and rooms light up. It’s cozy and unique. Very cool! Very cool! I love the idea and the link to the trash station was even more fascinating. I have the same tendencies to want to do something with all the containers involved with consumer purchasing. I just don’t have the creativity and skills that Molly and her husband seem to have. I find myself not buying certain items because I can see it will be a total pain to cut up the trash and stick through the shredder. One day I was walking into the grocery store with my daughter. She pull a handful of trash out of her bag and tossed in the garbage can. She had been saving it so she could throw it away and not have to cut it up! She’s such a cheater! I absolutely love this idea! We spent a few weeks in Mongolia a while back, and my best memories are of yurts. The first, staying in a random couple’s yurt – their home – for the night, because we had been slow during the day and didn’t make it to our destination in time. Our guide found out about locals who were away for the night, we asked permission and suddenly we had accommodation. It made a *huge* impression. The second memory is of staying with a family used to hosting tourists. They’d just moved to their summer location, and while we were there they assembled the last remaining yurt. It took a total of about 1.5 hours, and was an interesting process to watch! It took us hours to set the yurt up originally! We would get the roof poles all set about 1/2 way around and than one of us would tap a pole on accident and they would all come tumbling down. I guess it’s like most things- you do it enough and it get easier! Molly-This is genius. Once you get it done, you can sell them online; or maybe just instructions or a kit. Who doesn’t have way too much junk mail? I’m waiting for one of our million ideas to actually make us some money! I’m all about the instructions right now- no inventory to store! Molly – you can setup a yurt B+B. It’s your next venture. Thanks again for guest posting. What a very fun topic. That’s definitely a benefit of having a little land, you can do a lot with it. I don’t have much of a back yard, so I’d have no where to put a little guest cottage even if I wanted to. Sounds really cool, but do you have any plans for air circulation in the yurt? Maybe a window? Great question! In the original yurt we had a section in the skylight that you can open to let hot air out and a few holes in the floor to allow for air circulation (It was set on pallets with sheets of 4×8 plywood for the flooring). In the new yurt we are debating on cutting a window in on the south side. We would make it operable. Again we would put some venting in the walls to let the air circulate. Other ideas are to add a small room that would house a compostable toilet and shower. Wow Molly, how incredible original! And to think, I was patting myself on the back because I was saving my junk mail to write notes and ticker symble on (lol). Your recycling effort and success puts me to shame! That is so neat, and the winter photo looks really cozy. Very interesting way to reuse all of that junkmail too; you guys are true pioneers. Hi Molly! I read on your blog that you did guest post here so I followed the link. This is another inspiring story from you. And now I know what “yurt” means. Thanks for this. It’s appropriate time to make some plans for the future and itt is time to be happy. I wiush tto read more things about it!